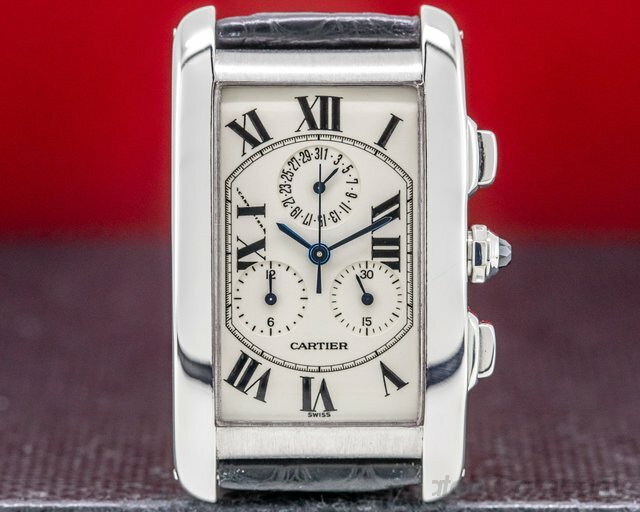 Below is our current in stock inventory of Cartier watches. 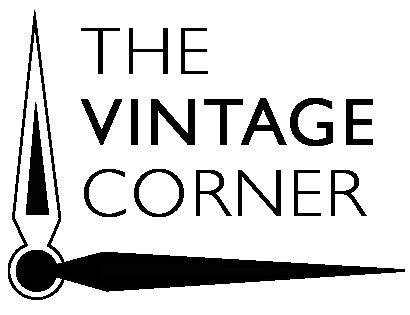 If you have a Cartier you are interested in selling or trading please contact us. 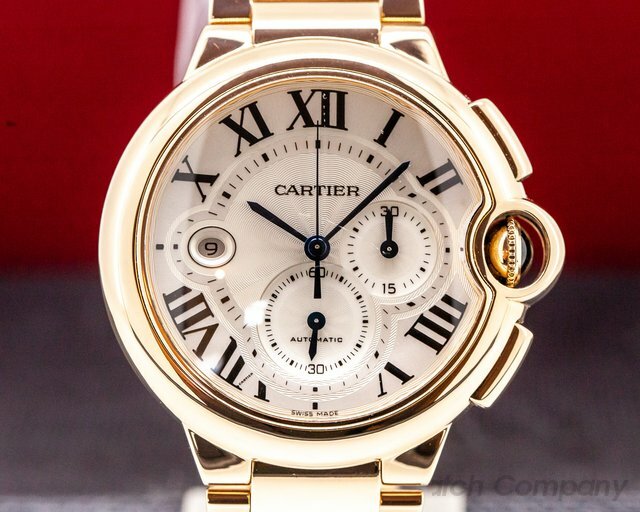 30960 Cartier W26033L1 Tank Americaine Chronograph, 18k white gold on an 18k white gold bracelet, quartz movement, split timer chronograph feature, cream dial with black Roman numerals and blued steel hands, date at 12 o'clock, crown set with a faceted sapphire, sapphire crystal, water resistant to 30 meters, size: 45 X 27 mm, thickness: 7 mm, Like New with Cartier Box. 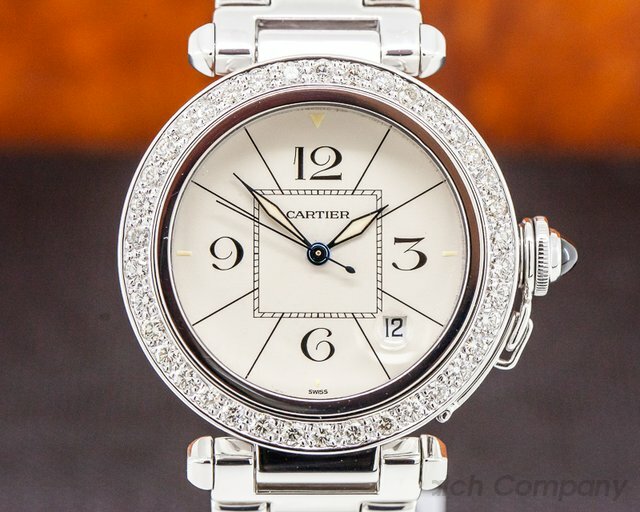 31058 Cartier Ballon Bleu 42MM W69012Z4, stainless steel on a stainless steel bracelet, automatic movement, silver opaline dial with roman numerals and blued steel hands, centered sweep second hand, date, fluted crown set with cabochon, sapphire crystal, water resistant to 30 meters, diameter: 42 mm, thickness: 13 mm, Like New with original box and papers dated December 2010. 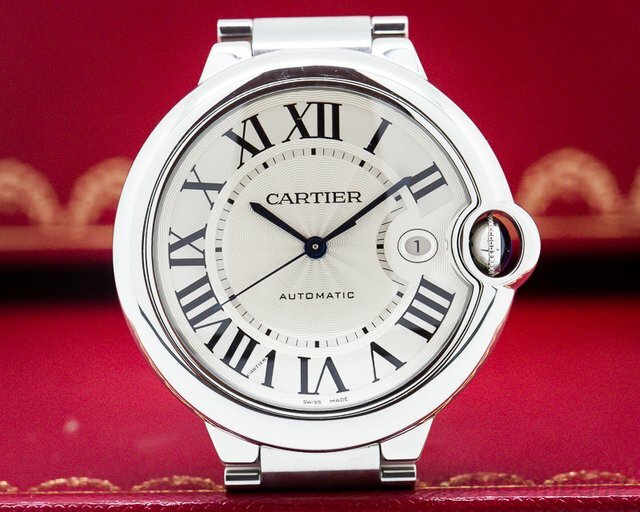 30530 Cartier Pasha Automatic 38MM, 18k white gold on an 18k white gold bracelet, automatic movement, date at 4 o clock, iconic cartier pasha dial with arabic numerals, Cabachon crown protector, aftermarket diamond bezel, size: 38mm, thickness: 10mm, date between 4 and 5 O'clock, sapphire crystal, water resistant to 330ft, Like New with Cartier Box.